Last night, The Wall Street Journal reported that the Trump campaign hired Stephen Bannon, the executive chairman of Breitbart News LLC, as its chief executive – a move that brings the campaign even closer to the nebulous Alt-Right movement. 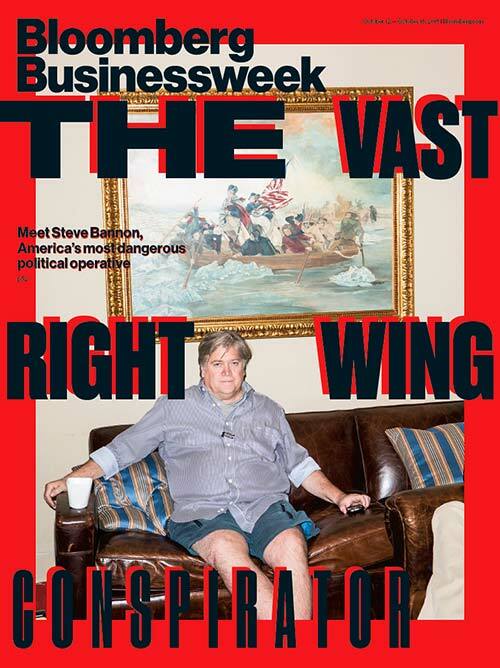 Stephen Bannon profiled by Bloomberg in 2015. The late Andrew Breitbart, founder of Breitbart News, once called Bannon "the Leni Riefenstahl of the Tea Party movement." Since the Republican primaries, Breitbart News has served as a major Trump campaign booster while also appealing to the insurgent far-right Alt-Right movement, which makes up a highly visible base of online Trump supporters. Donald Trump’s campaign has repeatedly been caught retweeting Alt-Right accounts and memes. Recently, Trump appeared at a campaign rally with a poster based on an anti-Semitic meme previously circulated online by notorious white supremacist David Duke. With Bannon embracing Trump, all that changed. Now Breitbart has become the alt-right go-to website, with [Milo] Yiannopoulos pushing white ethno-nationalism as a legitimate response to political correctness, and the comment section turning into a cesspool for white supremacist mememakers. Over the past year the media outlet has been openly promoting the core issues of the Alt-Right, introducing these racist ideas to its readership – much to the delight of many in the white nationalist world who could never dream of reaching such a vast number of people. The slow, but steady, shift toward more radical ideological content is troubling considering Breitbart’s reach. Breitbart.com is one the top 1,000 most popular websites on the Internet, and just outside the top 200 most popular websites in the United States, according to Alexa. Along with the hire of Bannon, Trump campaign worker Kellyanne Conway – a pollster often cited by anti-immigrant and anti-Muslim organizations such as the think tank Center for Security Policy and NumbersUSA – was promoted to campaign manager. Political observers, however, speculate that the hiring of Bannon will further erode hopes within the GOP that Trump will rein in his trademark bombast and “pivot” toward the center.